The Warehouse Ltd have initiated a consumer level recall of all batches of Tresor Dore brand Chocolate Seashells, Flavoured Chocolate Truffles, Chocolate Assortments, Chocolate Flaked Truffles, and Chocolate Biscuits due to the due to the presence of an undeclared allergen (peanuts). All batches are affected by this recall. MPI have received one associated report of reaction relating to this product. The affected product is imported from China and is sold in The Warehouse stores throughout New Zealand. Click here to subscribe to MPI for updates on the latest food recalls. The Finger Food Shop is recalling all batches and dates of its Curry Rice Rolls due to the presence of an undeclared allergen (soy). Click here for more information from MPI on this food recall. Chantal Organics Ltd is recalling a specific batch of Loving Earth brand Coconut Chocolate Butter due to unclear labeling about the presence of allergen (tree nuts). People with a tree nut allergy or intolerance should not consume this product. For more information on this and other recalls, click here. A consumer level recall has been initiated by Cham Foods Ltd. Cham Foods Ltd are recalling all batches of its seasoned sliced radish due to the presence of undeclared allergens (sesame and soy) and repackaged Wang kimchi due to presence of an undeclared allergen (sesame). These products are sold at Cham Foods Limited, 14 Bishop Lenihan Place, East Tamaki, Auckland and S&S Fresh Limited, 312D Tī Rākau Drive, Auckland. MPI have not received any reports of associated illness. The products have not been exported. To receive the latest updates on food recalls, subscribe to MPI. Radix Nutrition Ltd is recalling specific batches of its ready-to-eat, freeze-dried meals due to the presence of an undeclared allergen (milk). For more information on this food recall, click here. Genevieve's is recalling specific batches of its Truffled Chicken Liver Parfait and Truffled Duck Liver Parfait due to the presence of an undeclared allergen (fish). Customers are asked to check the date marking on the product. People with a fish allergy or intolerance should not consume these products. If you have consumed these products and have any concerns about your health, seek medical advice. If you are not allergic or intolerant to fish, this recall does not affect you. Customers should return the products to their retailer for a full refund. Al Mina Mediterranean Patisserie - all products up to and including Best Before 15/12/18. The recall is due to the presence of undeclared allergens (almonds (tree nut), soybean, wheat and sesame seed). If you have consumed this product and have any concerns about your health, seek medical advice. If you are not allergic or intolerant to milk, this recall does not affect you. House of Fine Foods Ltd is recalling all batches of its Ma Baker brand Party Mix (marshmallows) due to unclear labelling about the presence of an allergen (milk). Consumers with a milk allergy or intolerance should not consume this product. If you have consumed this product and have any concerns about your health, seek medical advice. If you are not allergic or intolerant to milk, this recall does not affect you. For more info on this recall, click here. Importers are recalling all batches and packaging variations of Lotte brand Choco Pie due to the presence of an undeclared allergen (tree nuts). People with a tree nut allergy or intolerance should not consume this product. If you have consumed this product and have any concerns about your health, seek medical advice. If you are not allergic or intolerant to tree nuts, this recall does not affect you. Customers who are allergic or intolerant to tree nuts should return the product to their retailer for a full refund. A consumer level recall has been initiated by a number of importers. The importers are recalling all batches, dates and packaging variations of Lotte brand Kancho Choco Biscuits due to the presence of an undeclared allergen (peanuts). This product also contains the following allergens that may or may not been declared on the label: gluten, milk, soy, egg and tree nuts (almond). All batches, dates and packaging variations (42g and 54g boxes, 216g foil packets and 95g pottles) of this product is affected by this recall. The affected product is sold in supermarkets, retail outlets, ethnic grocery stores and online stores throughout New Zealand. The product has been imported from the Republic of Korea. We have not been notified of any associated reactions in New Zealand. Importers are recalling all batches of Ganyuan brand Crab Roe Flavor Sunflower Seeds due to the presence of an undeclared allergen (peanuts). People with a peanut allergy or intolerance should not consume this product. Pams Brand Tex Mex Butterflied Chicken due to undeclared allergens - gluten and milk. The affected product is sold in Pak'nSave stores in Auckland - Mt Albert, Mt Wellington and Royal Oak, and Clarence St in Hamilton. Subscribe to MPI updates page. Importers of Te Chang Food brand Towfu (Bean Curd) Cake *Barbecue/ Sha Char flavour) products are being recalled due to the presence of undeclared allergens (peanuts, tree nuts and sesame). If you are not allergic or intolerant to peanuts, tree nuts or sesame, this recall does not affect you. Hubbard Foods Ltd is recalling specific batches of its Hubbards brand Simply Toasted Muesli Original 650g due to unclear labeling about the presence of an allergen (tree nuts). People with a tree nut allergy or intolerance should not consume this product. Source Bulk Foods are recalling batches of their The Source brand coconut milk powder due to undeclared milk (dairy). It is recommended that those with food allergies Subscribe to MPI updates page. This will ensure further updates will be emailed directly to you by MPI. Additional recalls due to undeclared gluten have been notified by MPI. These include 5 products and for buckwheat flour sold from multiple businesses. This is due to imported buckwheat flour found to contain gluten. Old Country Food brand BBQ Pork Buns (undeclared peanuts). Woolworths Select brand Toasted Muesli - fruit & seeds – ( undeclared milk). Manuka Melts brand New Zealand Manuka Honey Melts original flavour (undeclared propolis). Please go to http://www.mpi.govt.nz/food-safety/food-safety-for-consumers/food-recalls/ for more details on each of these products. A reduction in the injection time for EpiPen®s from 10 to 3 seconds has been approved for New Zealand and Australia. Go here for more information. Australasian Society of Clinical Immunology & Allergy (ASCIA) have recently updated their guidelines on how to introduce solid foods, including egg and peanut, to babies for allergy prevention. Go to here. Allergy New Zealand product notices are emailed to our database, placed on this website, facebook and twitter. Latest product alerts are listed below. These include recalls of products involving allergens as well as other product alerts such as labelling issues, product reformulations or notices about products. Follow your allergy action plan. Seek medical advice if necessary. If a known allergen is not declared on the label, contact the manufacturer to find out if the allergen is in the product, or if there is the likelihood of cross-contact with the allergen. Keep a record of all correspondence with the company - date, times, who you spoke to and information or explanation given. If you suspect an undeclared allergen is in the product, contact MPI (Food Safety) on 0800 00 83 33 or by email: info@mpi.govt.nz. Also, inform Allergy New Zealand of your complaint and who you have passed it onto (email allergy@allergy.org.nz or phone (09) 623 3912). Keep a sample of the product and the original package. Make a note of the batch number and best before date, and exact product name and size. If an undeclared allergen is detected, a product recall may be issued. Contact your specialist or doctor for follow up consultation. If likely causes have been ruled out, it is possible a new allergy has developed. Keep the original package and affected product, noting details as in (5) above. Contact the manufacturer to inform them. Keep a record of your correspondence, and inform Allergy New Zealand as in (4) above. 31 January 2017: Real Kitchen is recalling specific batches of its Real brand Vege Crunch Beetroot & Carrot (snack food) due to the presence of an undeclared allergen (soy). For more information go here. 27 January 2017: MOI Agencies Ltd is recalling its Delish brand Choc Hokey Pokey Biscuits due to the presence of an undeclared allergen (milk). For more information go here. 15 December 2016: Flush Fitness Pty Ltd is recalling specific batches of its Lenny & Larry’s brand The Complete Cookie, Chocolate Chip Flavour due to the presence of an undeclared allergen (milk). People with a milk allergy or intolerance should not consume this product. If you have consumed this product and have any concerns about your health, seek medical advice. If you are not allergic or intolerant to milk, this recall does not affect you. For more information go here. 7 December 2016: Griffin’s Foods Ltd is recalling a specific batch of its Griffin’s brand Choc Chippies Muesli Bars due to the presence of an undeclared allergen (peanuts) as the product contains Nice & Natural brand Roasted Nut Bar (Mixed Berry) inside the cardboard box. For more information go here. 6 September 2016: Ottogi NZ Ltd is recalling all batches and Best Before dates of its Moguchon brand Canned Retort Ham due to the presence of undeclared allergens (milk and soy). Consumers with a milk or soy allergy or intolerance should not consume these products. More details Click here. 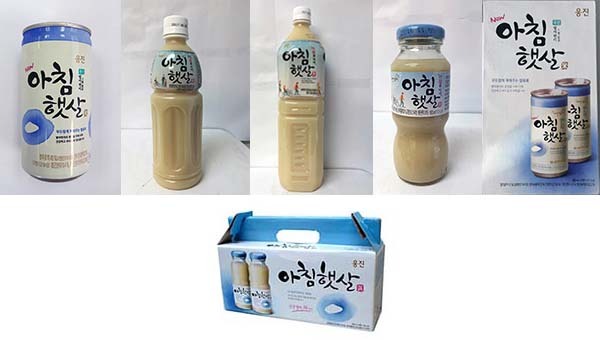 Importers of Morning Rice Drink made by Woongjin Foods Co. Ltd are recalling all batches, dates and packaging variations of this rice beverage product due to the presence of undeclared cow's milk. 1 July 2016: Pita Bread Ltd is recalling all batches and all dates prior to Best Before 02/08/16 of its Danny's brand Garlic filled Pita Bread, Olive filled Pita Bread and Garlic filled Wholemeal Pita products due to the presence of undeclared soy allergen. UPDATE: This recall was undertaken on 7 June 2016, however since then the affected batch may have been released to New World, Pak'n Save, Four Square stores and retail outlets throughout the South Island due to a mistake in the Griffin's distribution centre. Distribution: The product is sold in retail outlets and supermarkets throughout New Zealand. The product has not been exported. Notes: This recall does not affect any other Eta brand or any other products manufactured by Griffin's Foods Ltd. This MPI consumer recall notification is here. Redwood Pacific Ltd will be recalling the following products due to the presence of an undeclared allergen (milk). All lot codes are included in this recall. The product is imported from Denmark by Redwood Pacific Limited and was sold in Countdown and The Warehouse stores throughout New Zealand. Panpac Distributors Ltd is recalling its Rewa brand Instant Full Cream Milk Powder (450g) (Best before: 06 Sept 2016) due to the presence of undeclared soy allergen. People with a soy allergy or intolerance should not consume this product. If you are not allergic or intolerant to soy, this recall does not affect you.